The Broil King 923610 Vertical Charcoal Smoker will run you north of $400 at most places we have seen, but sometimes Amazon can drop the price to just below $400, so just keep an eye out. UPDATE: As of this writing Amazon does sell it for $399 which is great so check the price by clicking the “Price Link” image below to see current price. But with that said, you won’t find another smoker in this price range with as many satisfied customers as this one. From the assembly (a snap to put together) and the generous cooking space, this smoker is a backyard meaty dream. Extremely sturdy and aesthetically cool, this is a great addition to any family, especially if you’ve got a host of folks to smoke for and want a quality product that won’t let you down. Well worth the bucks, a solid choice for all aficionados. In a world of things that are cumbersome to assemble, the Broil King is not one of them. 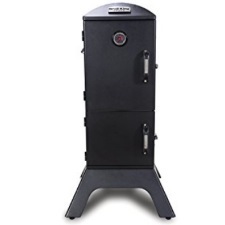 Now, this wouldn’t be a key feature if this was an $80 smoker, but this is a 70 pound, $400 plus unit that in theory should be a bit of hassle to put together. But it couldn’t be easier, and Broil King is to thank as the instructions are clear and reviews over multiple sites attest to the same – one of the easiest smokers to assemble, hands down. It’s rare to find a smoker at this price and just 70 pounds with a whopping 770 square inches of cooking space. Pretty generous which all in all adds up to four cubic feet of cooking capacity via the adjustable cooking grates. To get at this space the Broil King Vertical Smoker features two doors, the second one providing access to the water pan and smoker box. This minimizes heat and smoke loss from the main cooking oven. A real find in the smoker world. The Broil King 923610 Vertical Smoker, from what we found, has roughly 2 dozen reviews averaging a 3.7-star rating from several online retailers and Amazon with so far … 8 reviewers. That’s not bad especially when a smoker is selling for around the $400 mark and there are other comparable smokers for less. However, this same guy gave it 5 stars and this last part followed nearly four paragraphs of rave reviews! That Broil King comes correct with this smoker, especially considering that 4 cubic feet of cooking space is quite generous for only weighing 70 pounds. An investment at $400 plus, but that $400 will pay dividends over time as you will likely have this for 10 plus years on top of pounds and pounds of tasty smoked meats.